Master X Master (MXM) is a free to play action MOBA where players battle it out as a variety of different characters in both PVE and PVP content. With sharp graphics and a quick combat playstyle the game offers lots of strategy to players who can customize their characters and master the art of tagging; taking two different characters into battle and freely switching between them during the fight! The game is a mash-up of Action RPG content with its PVE campaign mode, allowing players to battle through quest focused areas to earn loot and currency or battle it out in two PVP modes; Arena Battles and the core MOBA matches. Players control their characters from a top-down camera angle using the WASD keys, aim with their mouse and use skills on the QER keys. Using the middle mouse button allows a player to change between their two selected characters, whether in PVE or PVP, allowing them to cover multiple roles in a single character such as having a healing Support as well as a DPS Assassin, or having two different Supports to ensure their team or group always has someone to keep them alive. Each character has its own skills and health bar, when a character has taken damage then if it is switched into the inactive role it will begin to heal itself. There are dozens of characters to choose from, many of which are from NC Softs various franchises (Wildstar, Blade & Soul, Lineage, Guild Wars, etc.) with some new faces that are unique to the title. Each character has its own role and skills that define its playstyle. New characters can be unlocked by spending currency, both real or earned, as well as completing quest objectives where players will need to recover a number of items from the PVE stages with each character having a unique item assigned to them that players must recover. The two main PVE modes are a campaign based on the planet of Karith where players can battle through four different stages at different difficulty settings for some repeatable content. At higher difficulties players won’t just see the same enemies but with more hitpoints, instead enemies will acquire new abilities and players will actually come across new enemies completely. Campaigns can be completed solo or players can group up with each other to help each other complete the stages at more difficult settings. The Dungeon mode is a more challenging area with more monsters that are a lot harder to kill and typically requires a group of players to fight through. There are two PVP Modes: a 3 vs 3 Team Death Match mode where players battle it out in a small enclosed arena, spawning at each side in their own base, and must fight to kill the enemy earning points per kill. The main game mode for PVP is the huge MOBA map where two teams fight to control three lanes, pushing their waves of minions towards the enemy base, destroying enemy lane towers and fighting against the enemy team in an action packed 5v5. 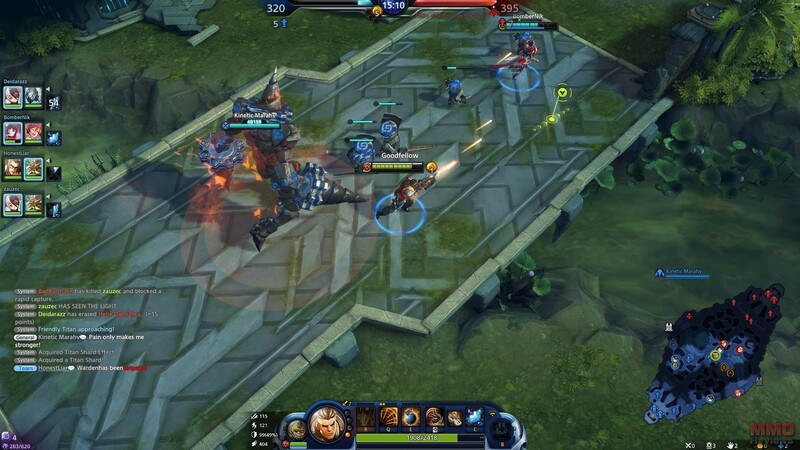 Throughout the game players will earn skill points to upgrade their QER skills, which will improve that keys skills for both of their characters, they can take control of different objectives such as champion camps which spawn a champion to attack the outside lanes, whilst increasing their teams score by completing objectives. When certain point thresholds are reached a Titan NPC spawns at the team’s base and marches down the central lane to try and destroy any structures it comes across, including the core when it reaches it, also these Titans are a source of Titan shards which allow players to temporarily transform into a controllable Titan themselves. The first team to destroy the enemies’ core structure, reach 1000 points, or whoever has the most points at the end of the 30 minute match time is declared the winner.